Is iWriter Legit, Or Content Mill Scam? Last updated on January 23, 2019 By Nat 2 Comments This post may contain affiliate links. We appreciate you supporting Rags To Niches! Full disclosure here. Is iWriter Legit, Or A Content Mill Scam? When I was a child, I wanted to be a famous author. I used to write all the time. Stories, poems and write daily in my journal. However, once I was a teen, the writing went out the window for a long time. Still, I always thought that some how… one day… I would write! I just never thought it would be writing on the internet one day – let alone on my own blog. As well as having a blog or website however, tonnes of bloggers who also supplement their income by Freelancing. Actually, many bloggers end up exceeding their blogging income through Freelancing! But where do they start? Today, I’m looking into iWriter – which on the surface, may look like an easy route into writing online for some. In reality though, it really isn’t at all. If you’re a blogger or website owner, you may also be interested in purchasing low-cost content from there, (I have myself) but there are some issues with that too. Today, I will be looking into the pros and cons of joining iWriter – for both the potential writer and someone seeking out content. So, stick with this post to the end and it should manage to answer your questions. If you’ve had experience on iWriter, I’d also love for you to share your experiences below in the comments! This can really help other people researching this company. If you’re really serious about Freelancing, I suggest you take a look at Gina’s awesome course: 30 days to freelance success. You can also pick up her copy of 200+ freelance niches for free here. iWriter is a website where you can both purchase content, or write content varying amounts of money. It’s very simple to join, whether you’re a writer, or someone looking for content. You simply sign up and can get started right away. At the lowest level, there are far less articles available and a much higher demand from writers – as all the standard writers are scrambling at the bottom to get these articles and level up. As a client though, you can simply fill in the form provided on the platform stating what your article is about, word count and special instructions – you can also specify what level of writer you want, (the higher the level, the more you will pay). There are three levels – at each level, you are paid more. These levels are standard, premium and elite and elite plus. 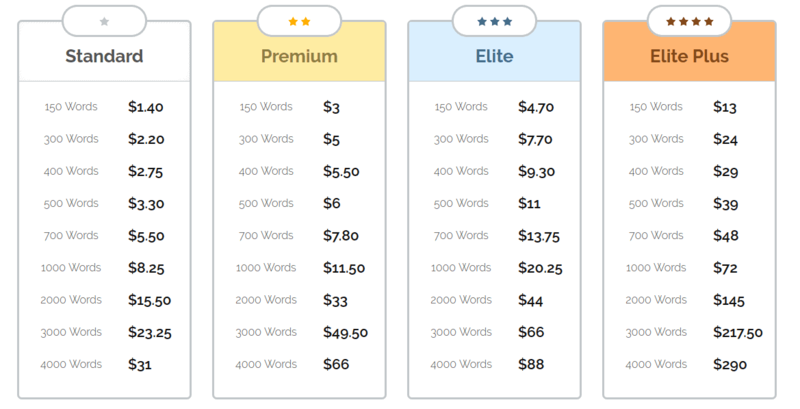 But to simply get from the standard level, to the premium level – you need to writer 25 articles in premium and have an average star rating of 4.1 to get bumped up to the premium level. From there on, it should be far easier to move up in the ranks, simply because there are far more articles available for you to choose from. The Big Hurdle: Getting Started With iWriter! One big issue with iWriter… is getting started as a writer at all! Yes, sure, you’re able to “get started right away…” in theory! But good luck finding any available jobs to do. Often there can be limited projects available for standard writers and another thing I noticed is that people are often very specific about ONLY accepting a certain writer and that’s it. As you can see in the image about, some people can sound quite rude about it. I’ve seen this regularly. In fact, I think this is one of the most difficult aspects to iwriter. As I’ve been preparing to write this, I’ve kept checking back for potential standard articles and there are hardly any available. Most of those requesting standard writers, have a specific writer in mind and they don’t want anyone else. It must be incredibly hard then to get enough standard articles written in order to move up to the next level. As a standard writer, you will also get paid next to nothing for your work. Although, the standard of writing can receive, can also be very poor! I have opted for various levels article wise and the standard has largely been very poor, (apologies to all the good writers on the platform!). While you have the option to reject an article, it does feel like trying to find a diamond in the rough. I did find one writer that was pretty good in the end, so do exist – but it’s not easy to find them. As an elite writer, you can get paid up to $14.99 for 1000 words. That’s still not much at all, but if you’re efficient at researching and writing, it could also not take you very long to write 1000 words. You can simply bypass all this and jump straight into premium or elite status… but you will have to pay $197 to do it! As part of your application, you will need to write 3 articles for them. Depending on how they rate the articles, they will decide whether to promote you to either premium, or elite level. Have any of you taken the fast track program? Do you think it was worth it? Let me know in the comments. If I saw that it was possible to get enough standard articles written to move up, then I would see no reason for this fast track option. But there seem such a limited amount of available standard articles, that I’m not sure how possible it IS to progress in the way iwriter has set up. Have you managed to get enough standard articles? Any tips for other writers? Leave a comment below! What I have been trying is relentlessly refreshing the browser every five minutes or so. Every now and then, a new article will appear on the standard list. But it goes almost instantly. There must be a lot of writers waiting and doing exactly the same thing. So, I guess the lesson is, the best articles are snapped up in an instant and you have to be eagerly waiting, with iWriter open in your browser. If you don’t particularly like communicating directly with clients, this is a bit more hands off and anonymous. You can become a favourite to some clients, which could then lead to regular work. This seems to be how some people have found some success with it. It could be a way to ease yourself into freelancing, if you’re a bit unsure of it and just want to get some practice in. You could use the platform as practice for writing in a variety of niches, (best if you’re not too bothered about the state of your account, as it’s only temporary). Therefore, you could be quite relaxed about it, expecting some rejections for example and testing out what niche is a good fit for you. IWriter did have a reasonabl reputation for paying on time, (but now I’m seeing some complaints about this!). If the client likes your work… you may get a tip! (But it’s unlikely!). In the beginning, you’re paid next to nothing and even as an elite writer, it’s not great! People requesting content can just reject your aritlce for any reason they want. Some of the people requesting writing seem to want a huge amount for very little and do not treat the writers with respect. 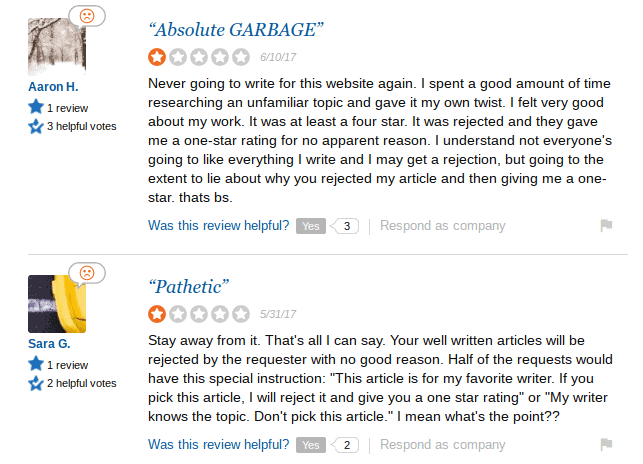 Those requesting content can also say whatever they want in their review against you. It may be VERY difficult to get enough standard articles and reviews in order to move up to premium level and it will take a lot of hard work and constantly checking back to iwriter. There are some scammers who will reject you, give you negative feedback and steal your aritcle. If this is discovered, iwriter still don’t take down the negative feedback you received. It’s super cheap, but expect a standard to match. I’m sure there are great writers on the platform, but they are not easy to come by! Articles are ready to be snapped up at any time and you will often see an article is ready and waiting for you to approve after only a few hours in some cases. I have read that some of the Elite writers are very good. Although, that is certainly not always the case by any means, (in my experience). You’ll get people pick up your article, but that doesn’t mean it will be good! You’ll spend a lot of time rejecting articles and if you’re not comfortable rejecting people, it doesn’t feel very good. You’ll have a better bet getting something well written by choosing an elite writer, but that’s then furthering the issue of this system – where there aren’t enough articles for the newbies, (who may be great writers, but can’t get a gig!). It can be difficult to really convey what you want, when there is no back and forth communication. You simply have to explain what you want in the “special instructions,” and hope they pay some attention to it! Many people have complained that writers on iWriter regularly use spun, or duplicate content. Is iWriter Legit… Or Do You Feel Scammed? iWriter is legit, but has a lot of issues going on. The way the site is set up makes it really difficult for new writers to ever progress. There is also not enough done from iWriter to stop things like, spun and duplicate content being sent out. But also protection for the writer! The reason being, some of the clients treat the writers so badly and reject work for any minor reason – it’s also been found that articles have been stolen, not paid for and negative reviews from that client are still left on the writers account. iWriter claims they cannot remove negative feedback once it’s been left, (even when it’s been found to be false information and content has been stolen). But why not? From my perspective, this is the lowest of the low if you want to start freelance writing. From a purchasing perspective though, I can see the benefits of iWriter. When I’ve had articles written at iWriter, but I don’t buy them with the intention of adding them exactly as they are – I have used them as a framework to build on and have edited them and added more detail and so on. It’s been a cheap way to save some time. I haven’t found that the articles I have created were duplicates at all, but clearly other people have experienced this. If you really want to achieve success as a freelance writer though, I don’t see iWriter as a good way to go about it! I don’t see that the writers are treated with respect – you’ll get good clients too, but there seem some really unpleasant individuals on there. If you’re a keen writer, but don’t know how to go about it independently, check out Gina’s course. If you’re a keen writer, do you currently have a blog? Having blog or website can be a great way to showcase some of your talents and write within a niche that already interests you. While you may not get paid directly for all the posts you do, (although, you can get paid for sponsored posts) there are a variety of ways that you CAN earn from a blog eventually and it’s something that can grow with you over time. If you would like to learn how to start a blog/website within a certain niche and eventually how to make money from it, start learning for free here. If you have any experiences you’d like to share about iWriter at all, don’t hesitate to leave a comment below! So, after a long while, I recently started writing articles again with my iwriter account but I noticed payouts don’t add up. I’m receiving 70% of the project cost for special requests. But, the most recent update I could find on iwriter’s blog dated June 2 states that writers should receive 75% of the project cost for direct requests. The link to that update is pasted below. Have the website owners resorted to short changing writers? That’s very interested to read James, I wasn’t aware of this development. Have you tried contacting them directly and informing them about this?